SoftPlanet makes it possible for everyone to get free Dr. WEB Anti-Virus download directly from our servers. There is no registration needed for downloading. Dr. WEB Anti-Virus 9.0.0.11130 is a nice anti-virus security solution for your Windows operating system. The application comes with a 30-day trial period, within which you can try it for free. So you can download it and try it right away. Thus you will convince yourselves in its advantages and weak spots. The application comes with lots of available features. For instance, you are provided with real-time protection, multi-thread scanning, latest malware protection, etc. However please be aware that this product does not protect PCs against all types of Internet storms, as it lacks important security components like anti-spam, HTTP monitor, parental control and anti-virus network. 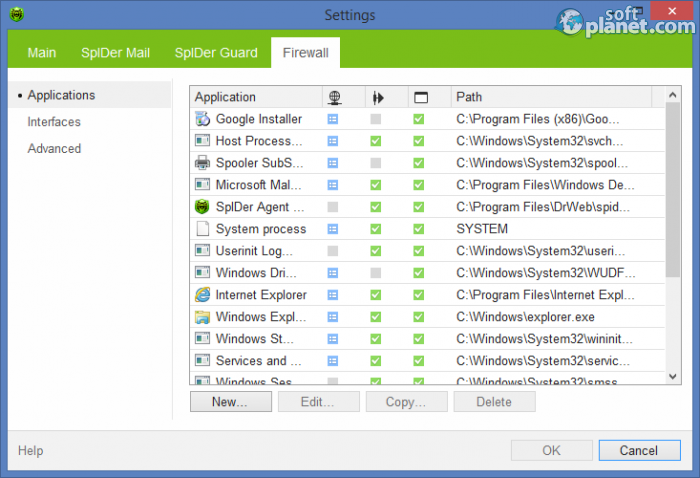 These components are available in Dr.Web Security Space. Dr. WEB Anti-Virus 9.0.0.11130 is a bit strange software utility, which doesn't come with a normal interface. It sits in your system tray, where you can access each separate features. 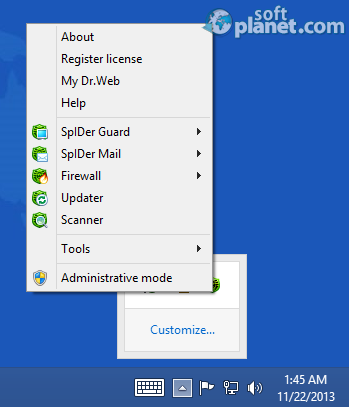 You can choose between two modes – User and Administrative. The second one gives you access to more options like settings, License manager, etc. However I really think that the most appropriate way to present features to the client is by creating an interface that will collect them all together. Thus the product will be more user friendly and intuitive than now. Probably this change has already been in the development pipeline for one of the next releases of the application. As I have already mentioned Dr. 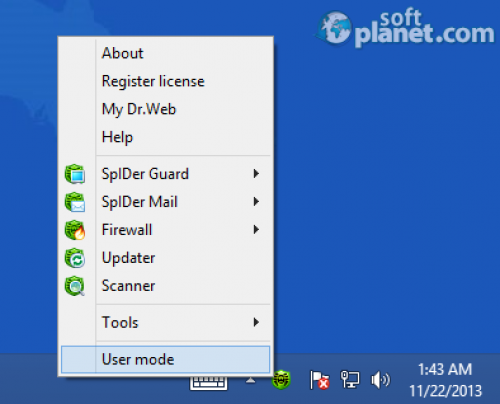 WEB Anti-Virus 9.0.0.11130 doesn't have an ordinary interface, which makes it a bit complicated for some users, especially beginners. Despite that it works just fine. All transitions run just instantly without any delays. The program is very stable as well. No bugs and crashes appeared during the entire test procedure. Dr. WEB Anti-Virus 9.0.0.11130 seems to be a proper antivirus solution for you Windows OS. However I would still prefer other products from McAfee, AVG or any other brand, only because they have a proper interface that gathers all features together. Dr. WEB Anti-Virus is VIRUS-FREE! Our security scan shows that Dr. WEB Anti-Virus is clean from viruses. The current version of Dr. 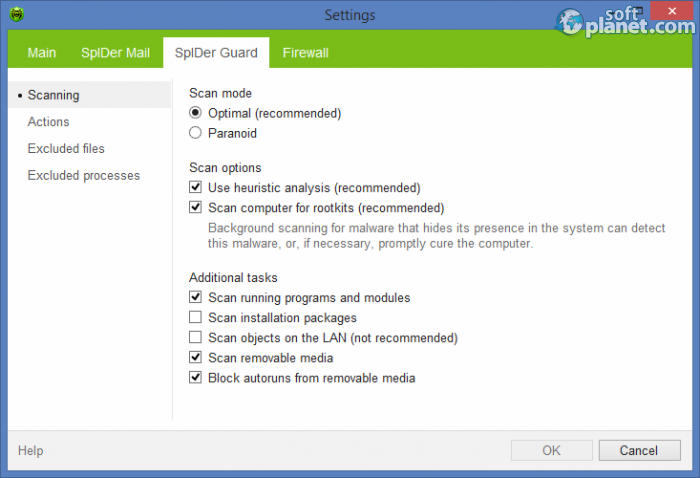 WEB Anti-Virus has been scanned by our system, which contains 46 different anti-virus algorithms. That ensures that Dr. WEB Anti-Virus 9.0.0.11130 is 100% safe for your computer.